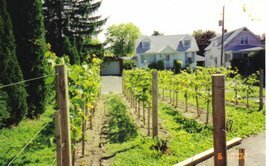 Backyard Vineyard & Winery: Good Intentions Will Not Make Good Wine! Good Intentions Will Not Make Good Wine! I began this year's growing season with good intentions, no, make that great intentions. Coming off 2007 which was the best year of my vineyard to date. 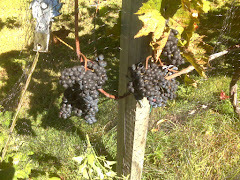 It was a year with great weather producing fantastic grapes and thus wines with great potential. Needless to say, I was all geared up for a repeat performance and then it happened,...LIFE! 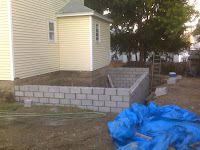 Back in March I started planning and preparing for a 300 square foot addition to my house which of course includes a new 300 square foot wine cellar beneath it. Sounds great I know, but the problem is I am doing part of the work myself. I had to do the foundation/basement, the electrical wiring, the chimney/fireplace and the painting. When I planned all of this out back in March, it seemed very feasible and reasonable for me. Well it's almost done, two months behind schedule and a good few thousand over budget. To say that it has been tough would be an understatement. I know these types of projects never go as planned but I never though it would take up all of my spare time. Spare time that is usually set aside for my vineyard and winemaking. I did the best I could under the circumstances to keep up with sprays and canopy management. The weather this year was a challenge with frost starting the year off and two damaging hail events (first time in 7 years!). All of this and a whole lot of rain in August caused me to almost write this years crop off as a loss. Almost, I said. I hung in there, never gave up and was rewarded with beautiful weather in September and October. The harvest numbers, while not coming in quite as nice as last year, were surprisingly good! I'll be posting info on each variety in the next week or so. Well, the addition is nearly done and I'm just so relieved to have the grapes in the cellar and processed. As a matter of fact I just crushed the final variety, Cabernet Franc, last night. Whew! I was amazed though at how many perfect clusters there were despite my negligence. I think maybe they knew what was happening and decided to help me out a bit. Thanks guys. Fast forward four years to our second harvest, making ecvery mistake you can. But don't give up hope. We won a gold medal for our field blend! Thanks for visiting and the kind words. I agree with you 100% on the finger lakes juice for your whites. Reilsing there is some of the best in the world. I stop into Hennessey once in a while too, but only when I don't have time to order online. Thanks again please stop by again and a great vintage back at ya! Congratulations on the Gold Medal! Just goes to show you, sometimes we just need to let the grapes do the work. Any problems with pierce's disease on the Gulf Coast? Thanks for stopping by!